A couple of months ago, I was lucky enough to meet with, and have a facial from, the lovely Madhvi at Elemental Herbology, and I was delighted by the results at the time. I was so delighted that I’ve been trying to replicate the results ever since with this little kit here. In a nutshell, Elemental Herbology believe that as the seasons change, so should your skincare, and, to that end, they provide both a “cooling, calming” summer range of facial and body products, and a “repairing, hydrating” of winter products. I do, very often find myself having to switch moisturisers once or twice throughout the year, and sometimes, I find the switching of brands irritates my stupidly sensitive skin, and it’s nice to know there’s a brand out there that’s thought of this too. 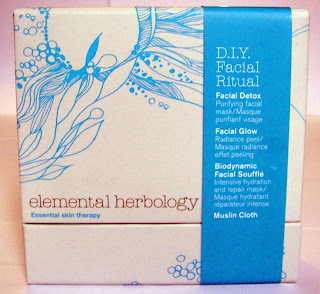 Facial Detox: which is a purifying facial mask, based on Amazonian Clay to resolve congestion and blackheads. Biodynamic Facial Soufflé: an intensive hydration and repair mask designed to provides instant hydration and repair the skin whilst nourishing it. Alongside these three masks, you also get a muslin cloth and a full set of instructions. Once a week, you cleanse your face with your cleanser of choice, and then use the masks in the order as above, Facial Glow for four minutes, Facial Detox for up to ten minutes, and you leave the Biodynamic Facial Soufflé on overnight. In between each of these, you give yourself a little steam treatment with the muslin cloth. This, whilst fairly time consuming, is a real pleasure to use. Many times, I’ve given myself a home facial (and, to be honest, I’ve had some professional facials that have done this too) and been left a reddened, inflamed, and somewhat greasy-faced monster. What I like about these products is that they actually do what they say they will, and yet aren’t overly chemical-laden or irritating to the skin. To take the products in order, the Facial Glow is a beautifully citrus-scented mask with some exfoliation beads in it, whilst it was on my skin it made it feel a little cooler, which was an odd sensation. Once it was rinsed off though, my skin very definitely felt smoother, and it felt a lot more velvety than usual. 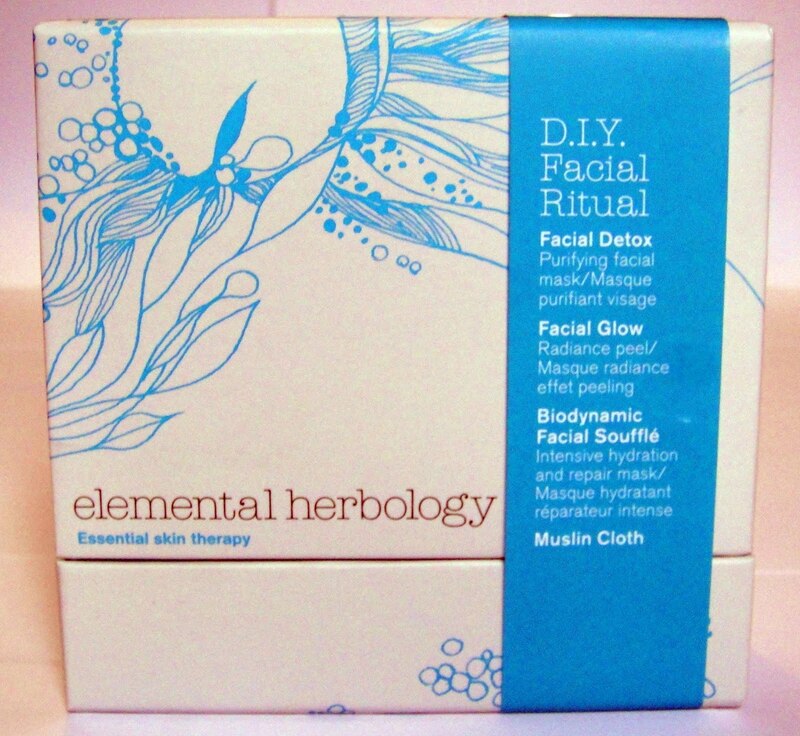 The Facial Detox is far more familiar to use, as it’s a clay-based mask that Elemental Herbology recommend you use only on your “congested” areas. I smeared a thick layer on my forehead, chin, and around my nose (classic T-zone application, really) and I found it definitely tingled a bit. In fact it tingled so much that I rinsed mine off after only six minutes, but it didn’t seem to harm the overall facial at all. The Biodynamic Facial Soufflé applies like a light moisturiser, but it’s very matte, and doesn’t absorb very quickly, which is why I think you’re supposed to leave it on overnight. 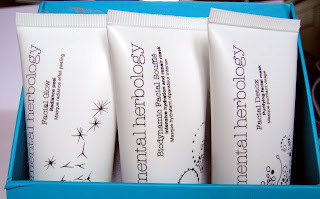 It was very refreshing not to have something greasy to apply after the other masks, and it smelt a little more flowery than the other two products. Immediately afterwards my skin wasn’t at all reddened, itchy or inflamed, it felt cool and velvety, and I liked the feeling very much. When I woke up next day, it was even better, the soufflé had totally been absorbed into my skin, and my skin was SO soft, and SO much smoother than it’s been in a long time, it was amazing! The effects have lasted several days now too, and I’m very impressed. Best thing: no breakouts! I estimate with the tube size, you’d get at least four – possibly more – full treatments out of this kit. It says it’s to be used weekly, but I think I’ll be saving it as a monthly treat for my face. I’m definitely going to try other products from this brand, the cell food moisturiser and the cleanser are most likely the things I’ll purchase next. I got my kit from Space NK and it cost £40. Holy Grail product, eh? That's high praise indeed! I'm totally going to try it as well, the effects of this kit have lasted several days, and I'm really impressed. Costs less than a facial too. The packaging looks divine and I guess this line is organic?! I really wanna get into their products as I haven't heard of them before!! i got my kit from harvey nichols in edinburgh for only £25 today! i know its been a year but that is a huge price drop!